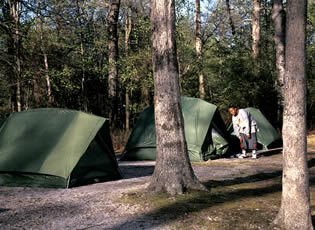 The Nomoco Activity Area group campground offers camping facilities for organized groups. An "organized group" is a group with a charter. Reservations must be made either in person or by mail and be in our possession at least 7 days in advance of camping date. Payment in full must be received before a receipt is issued. Payment in full consists of per site fee for the desired number of nights. Payment can be made by cash, check, or money order. Click here for fee information. See our refund policy. Checks should be payable to Monmouth County Board of Recreation Commissioners. A full refund for cancellation will be granted only if Turkey Swamp Park is given 48 hours notice prior to date of reservation. Group representative must check in at Turkey Swamp Park Office before occupying site in order to inform Park personnel of arrival, to obtain gate lock combination, and to gain access to cabins. Gates will be locked at dusk. Check out time is 12 p.m. Each site accommodates approximately 40 people. Firewood can be purchased at the campground office. Vehicles are allowed at sites for loading and unloading. Parking is permitted only in designated areas. No vehicle access is permitted to "Outpost" wilderness site. Adult supervisors must remain with groups at all times while using park facilities. Ratio of adult supervisors to youths should be at least one adult for every ten youths. Axes, knives, etc. must remain in adults' possession, and adults should supervise their use at all times. The Family Campground is not available to those using the Nomoco Group Camping Area. See our complete rules and regulations for Turkey Swamp Park Campgrounds. 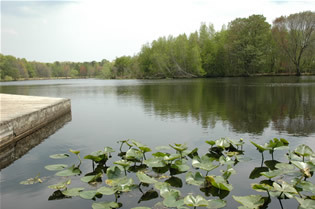 The site features a lake where visitors can bring or rent canoes, rowboats, kayaks, and paddleboats. Visitors who have a New Jersey fishing license (under 16 license not required) can try their luck with the bass, catfish, and bluegills that call the lake home. The park also offers picnic areas with charcoal grills, children's playgrounds, and plenty of open space to fly a kite, toss a ball, or watch the clouds roll by. The best way to explore this park is on its 9 miles of multiple use trails. Hikers, bicyclists, and equestrians can enjoy the pitch pine and oak trees of the wooded area while looking for wildlife. Other plants and animals associated with the Pine Barrens can also be found. The park also features an archery range, reserved group areas with open shelter that accommodates up to 250 people (fee), open playing fields, a shelter building with fireplace, and soccer fields for league use. 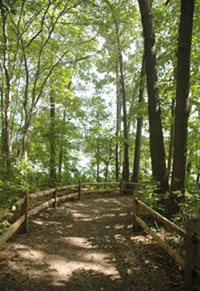 To learn more, visit Turkey Swamp Park Page. Interstate 195 to Exit 22. Turn onto Jackson Mills Road north. Follow Jackson Mills Road to Georgia Road, turn left and follow 1.7 miles to main park entrance. · State Highway 9 to Route 524 west. Follow 524 west to Georgia Road 1.7 miles to park.